The Board of Directors has rescheduled the Dredging Advisory Committee meeting to Saturday, November 24th at 10am in the Clubhouse. Please note that the Dredging Advisory Board meeting that was scheduled for November 3rd will be rescheduled. The Board will decide on a new date at their meeting this week on November 1st at 7:30pm in the Clubhouse. The RRA Board of Directors and Operations Manager will be hosting an informational Dredging Presentation at the Clubhouse on Saturday, August 25th at 10am. Please join us to learn details about our dredging program. Once the road ban was lifted this year, the RRA maintenance crew got to work on dredging for the year. The first step is to move the dried sediment from last year’s operation. Over 6000 cubic yards of sediment was removed last year alone. It is transported to the dewatering site where it dries out over the winter and is ready to move and collect by May. 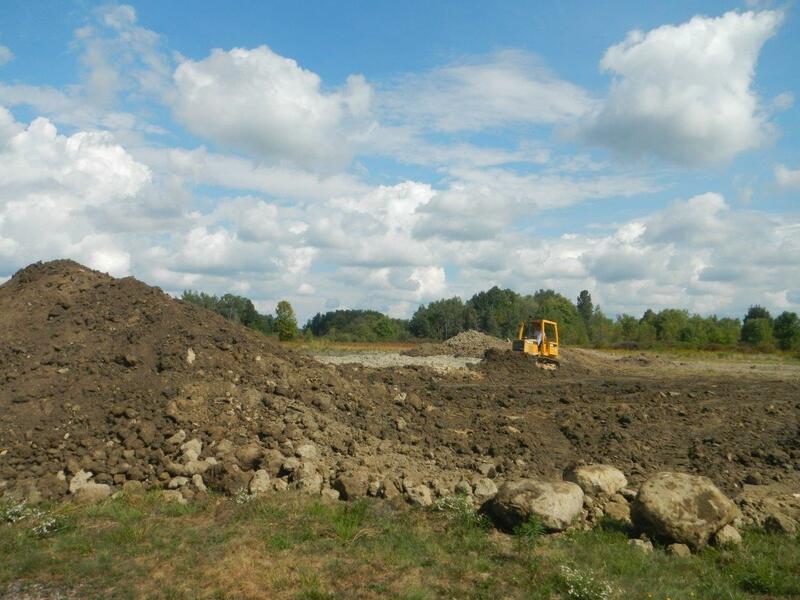 See pictures below of the dirt being moved to get a feel for just how much sediment was removed from our lake. During the dredging operation over the summer the maintenance crew will use the bulldozer to keep spreading material as it is removed from the lake. Top soil from this operation is made available to our Members free of charge. It is located next to our cinder bay behind the old maintenance garage near the RRA Office and on the RL Lot near Knowlton Entrance on Morning Star Dr. The 2016 dredging operation began April 16 right after the road band was lifted. The maintenance crew had the task of consolidating the material that was taken from the lake in 2015 to the dewatering site that was now dry enough for recollection, pictured below. 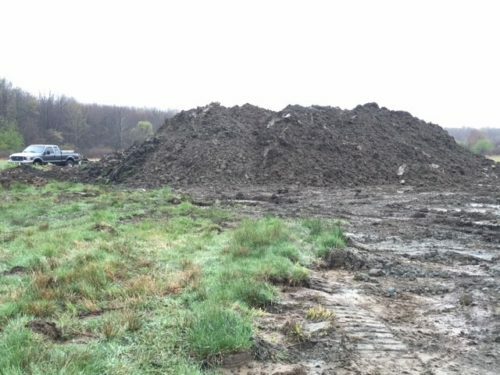 This task took approximately two weeks to complete, and involved using our bulldozer to re-pile the approximate 5700 yards of dewatered material. 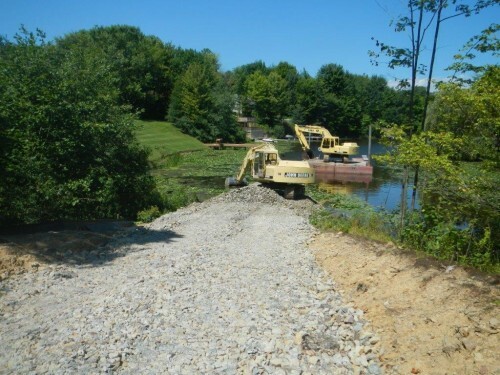 During the dredging operation over the summer the maintenance crew uses the bulldozer to keep spreading material as it is removed from the lake. The dredging barges were launched at the beginning of the month of May. The maintenance crew moved the barges to Fishermen’s Cove to begin dredging where they had left off last season. Material began being removed from Fishermen’s Cove beginning May 18. 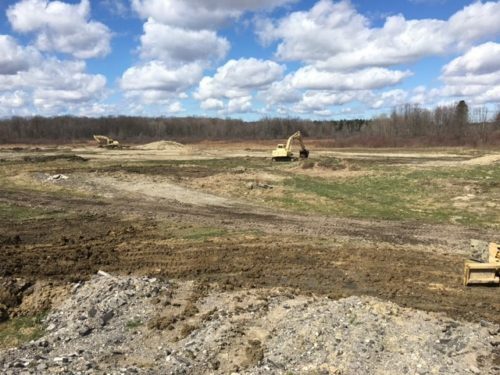 The dredging operation continued in Fishermen’s Cove through mid June where another approximate 2500 yards had been removed from the lake. At this point the maintenance crew also had to start preparing for the summer activities and having the amenities ready for the season. Utilizing our summer help to take care of most of the day-to-day work, general cleanup, trash removal and lawn maintenance allowed us to concentrate on our next area to dredge which was Nature’s Cove. A previous silt pond that was installed in the end of this cove had failed and blown out. This cove is the main inlet for a large agricultural farm on the west side of the lake. 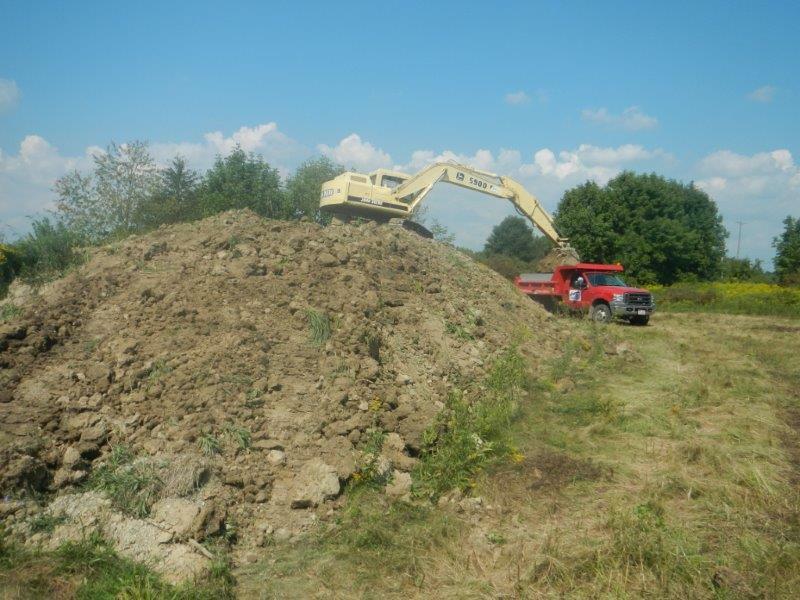 From mid June through mid July the maintenance crew removed approximately 1550 yards of material from Nature’s Cove. The dredging operation continued in July along with the preparation for our summer activities, 4th of July, and our 50th anniversary. It was a very busy summer. 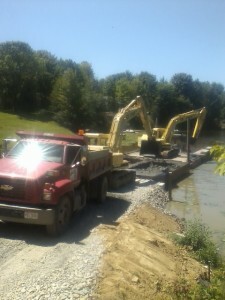 With Nature’s Cove complete, the dredging operation then moved to Sugar Creek Cove. 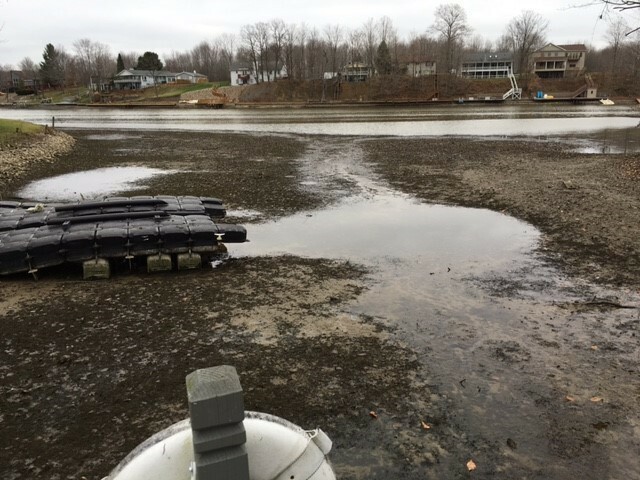 Next to the south end of the lake, Sugar Creek Cove had the next significant amount of silt build up and was identified as a cove that has the most boat docks that are unusable due to silt build-up. A staging area or take out point was installed at the inlet of this cove. The maintenance crew did try to remove material from the inlet of this Cove from land in December 2015 but was unsuccessful due to high water. A staging area or take out point was installed at the mouth of Sugar Creek near beach #2. This staging area had to be installed from land as it was too shallow to do from the water. This takeout point in Sugar Creek will now cut our turnaround time by two thirds. The dredging crew will return to Sugarcreek and keep dredging the south channel up to the takeout point at the east end inlet of this cove. The staging area at beach #2 will be used in 2017 as a takeout point for the fastest turnaround in this cove. 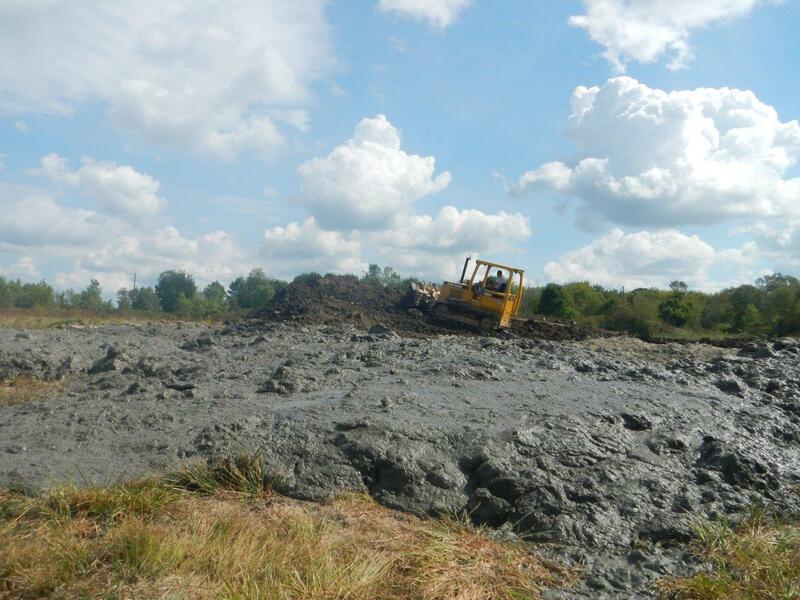 The amount of material removed from Sugar Creek last year was approximately 2490 yards. Looking forward to 2017, we will begin dredging in Sugar Creek. Our turnaround time in 2017 versus 2016 will be much faster with the addition of the staging area/takeout point added at beach 2. This will be a significant improvement in offloading the material. The amount of material still needing to be removed from Sugar Creek will determine the dredge operation for the season. I would like to add the maintenance crew continuously looks for improvements to increase our efficiency for the dredging operation. I am also pleased to report for the 2016 season there were no injuries involved with the dredging operation or damage to any of the equipment. Within the maintenance department safety is our number one priority on all of the projects and tasks done here at Roaming Shores. I would also like to mention that many residents took advantage of the topsoil and fill dirt that was made available to the residents free of charge that was located at the maintenance garage. Some residents came to pick up truckloads of material and other residents came with just a 5 gallon bucket to be filled. That service will be available again this year. We will keep material stored this season again at the maintenance garage free of charge for the association members. Looking forward to a successful 2017 season! Operation for the season began April 16th, the day after the road weight limit ban ended. 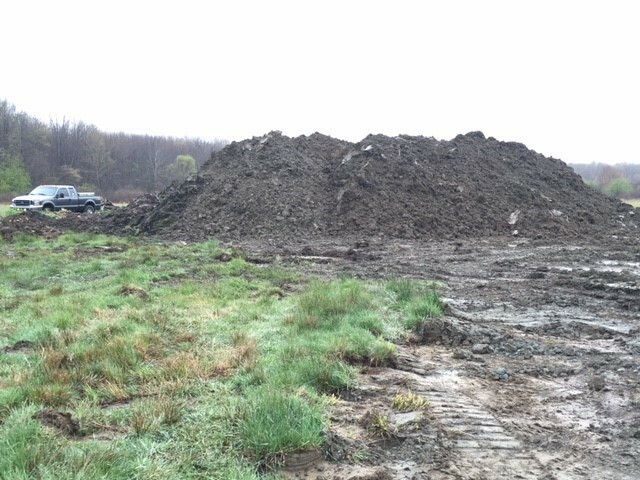 Our first task was to prepare the dewatering site which involved stock piling the material from 2014 to make room for the incoming material from 2015. This task was incorporated into the regular duties of the maintenance department along with the spring clean up from the previous winter, roadside clean up’s, downed tree limbs and pot-hole repairs, both pools had to be opened, beach clean ups, buoys installed on the lake, volley ball and tennis courts all had to be ready before Memorial Day, the start of the summer season. These tasks continued through April and May. During this time period, one of our full-time employees went out on a medical leave for most of the 2015 dredge & summer season. This loss of 25% of our manpower was a big setback, but adjustments were made and we moved forward. The staging area at Fishermans Cove was installed, pictured below, and the work at our dewatering site continued. This staging area was a challenge due to the heavy amount of silt in this cove. The barges were launched and the dredge crew finished a channel at the end of Plum Creek removing 90 yards from this cove. The dredge crew then moved to the small, unnamed cove, on the northeast side of the lake. This cove was cleaned out removing 150 yards of material to assist with road drainage on Morningstar. The dredge crew then headed to Fishermans Cove. On the way towards Fishermans Cove, a call came into the office that a very large tree had fallen into the lake at the mouth of Plum Creek. The maintenance crew was able to utilize the excavator and barges to remove this very large oak tree from the water. The dredging platform made this task safer and decreased the amount of time it usually would take to remove this type of obstacle. Prior to having the dredge platform to work from in the water, tree’s this size would take on average 2 to 3 days cutting pieces small enough to handle safely from a boat to remove. The tree in the below photo took 3 hours to remove from the lake. 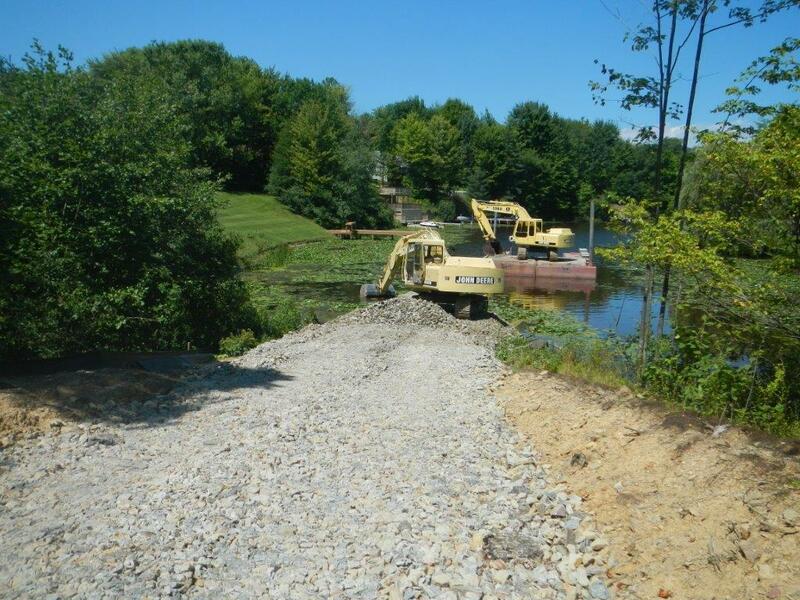 This versatility allows us to remove these types of obstacles from the lake in a safer and more efficient manner. 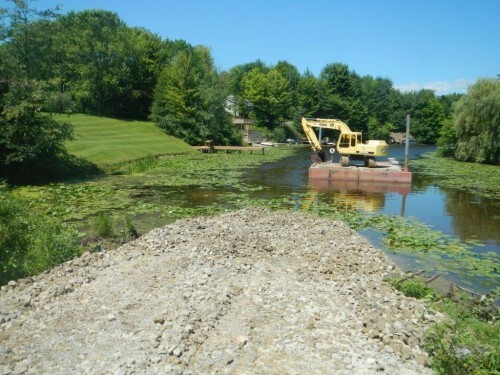 Material being removed from the lake moved into high gear on June 17th. The access to Fishermans Cove was finished and the dredge crew, in between keeping all of the other summer amenities maintained, began dredging. For the month of June, 8 days were spent on the water dredging and 550 yards of material was removed from Fishermans Cove. July was a busy month with the Fourth of July Fireworks and all of the other summer activities going on. Maintenance of the dewatering site, and access drives continued daily, pictured below. Another large tree was removed from Island Cove. The barge platform again made this task safer and allowed us to return to dredging the next day to Fishermans Cove. Along with their regular summer duties, the dredge crew spent 11 days on the water and removed 550 yards of material from Fisherman’s Cove. The month of August was the end for all but 2 part time summer employees. This kept the full-time crew focusing on amenities and the winding down of the summer season. The crew dredged on the water a total of 9 days for the month of August and removed 550 yards of additional material from Fisherman’s Cove. With the pools closing in September and the slowing of the need for grass mowing this allowed the dredge crew to remove 1,000 yards of material in Fishermans Cove in 10 days time. Our full-time employee returned to work on light duty, this had a positive impact on our production. 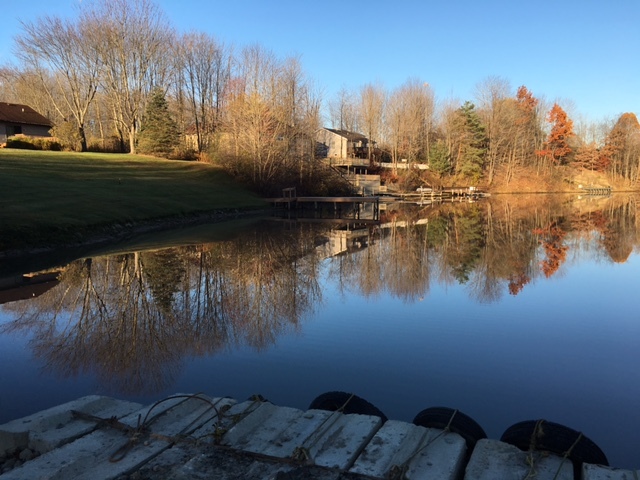 The barges were removed from the lake the last week of October before the lake draw down on November 2nd. There was the intention to continue dredging from the shore if the lake draw down was sufficient enough to allow this, unfortunately the cycle of drawn down did not allow us this opportunity. Overview – The 2015 season total of removed material from the lake was 5,790 yards. We used 255 gallons of off road diesel and 193 gallons of on-road diesel. 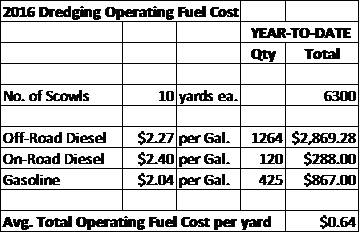 Our bulldozer consumed 65 gallons of off-road diesel for the season and our push-boat used 35 gallons of regular gas. We are very pleased with the performance of our equipment. We had no mechanical breakdowns in the 2015 dredge season. With this being our first full year incorporating the dredging operation along with the regular duties of the maintenance department, I am calling this season a great success! Moving forward in 2016, the dredge crew continues to improve on the knowledge gained and improving the process. The dredging schedule for 2016 will be to finish Fishermans Cove, then move to Nature’s Cove and then onto Sugarcreek. We are planning for another successful season in 2016! A lot of information about the dredging project has covered the work that occurs on the lake. But what happens to the sediment after it is removed from Lake Roaming Rock? After material is removed from the lake, it is transported to our site off of Crosby-Cook Rd to dewater (dry). Recently dredged material from Fisherman’s Cove being dumped. Background: Dried material being moved. Above is the material that has been removed from the lake so far this year. It is currently in the process of dewatering (drying). Once the material has dried, it will be added to the pile of dried material. Background: Reclaimed material being moved to dry pile. Material removed from Plum Creek lake year. The above material is of the reclaimed material from last year that is now ready for RRA projects. Please be advised that the September edition of the Shores News contained a misprint on the front page. The information contained in the article “Dredging process will soon begin” is from last year. Dredging began this year in June and will still be in operation on the water until November. If the lake draw-down is a successful, we will be able to dredge by land. The RRA Maintenance crew is now in Fisherman’s Cove for dredging. Fisherman’s Cove is the cove that had the most sedimentation according to the study performed by Enviroscience. It is located between Morning Star Dr and Belvista on the East side of the lake. Our crew will be dredging this cove for the duration of the year.